Spring is just around the corner! Just kidding: we’re only now moving into the darkness of autumn, winter, and seasonal affective disorder. But to help remind you that there is a literal light at the end of the tunnel, we’ve rounded up some of the biggest Spring 2015 trends we saw at Paris Fashion Week. Honestly, what would spring even be without the opposite of winter layering? (It would be fall/winter, obviously.) Anyway, Balenciaga offered a see-through midi dress worn with a bandeau and micro-mini, while Moncler Gamme Rouge followed a similar route with a contrasting option—both in colour and in skirt length. So think less “sheer” in a traditional sense of the word, and more a play on textures and patterns. 2015 is looking to see a little less chiffon—unless you’re talking about Rochas. Spring and summer normally see us shed fabric and layers, but not in 2015: Kenzo’s collection saw oversized blouses, trousers, and skirts (think 1999-2000, with a little mid-nineties realness thrown in), while Christian Wijnants added bucket hats and raincoats to already generous silhouettes. Makes sense, considering rebellion was kind of the name of the spring 2015 game. 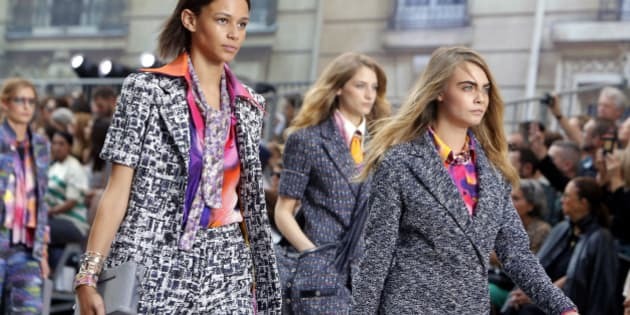 Chanel had a lot of spring florals and clichés—or at least that’s what we can take away from Karl Lagerfeld’s refined and business-casual offerings. However, it wasn’t boring—instead of standard flowers or pastels, he used bright pops of colour to breathe life into what could otherwise have been very safe designs. Finally, your work clothes don’t need to be boring. At least as far as Chanel is concerned. Can you blame anyone for wanting to bring back the seventies? The decade gave us everything from disco to punk rock and the styles that went with them. (Also: Mary Tyler Moore and Rhoda, the most fashionable women to ever star in television.) Fortunately, if you only embrace decades sanctioned by designers, you’re in luck: Jean-Charles de Castelbajac combined loud graphics with sheer fabrics, while suits by Chanel and Maiyet channeled the wonder that is Mary Tyler Moore and friends. It’s an exciting time for fashion right now: everything goes, there’s nothing you can really do “wrong,” and we have about a hundred options to choose from, all the time. That’s why the costume-like styles of Olympia Le Tan, Vivienne Westwood, and Undercover are so great: they give further permission to wear whatever the hell you feel good in, “dos or don’ts” come springtime be damned. Or, more specifically, white—but not delicately. Arguably, there’s nothing really “delicate” about next season, and the use of cream and white on heavier fabrics reflects that perfectly. Shows by Issey Miyake and Christian Dior gave us the tone through layers, geometric cuts, and substance, so we know that even when it comes to white, spring/summer 2015 doesn’t lose its edge. Here’s a trend that won’t be messing around in a few months: hats and headpieces, courtesy of designers like Junya Watanabe, Jean Paul Gaultier, and again, Olympia Le Tan. And the thing is, it’s not even like we’re talking about one type of hat and/or headpiece. Ultimately, put anything on your head, walk outside, and own the hell out of it. Anything goes, and spring fashion is included. It’s here and it’s not going anywhere, and we've never felt so alive. Courtesy of Chloe, Celine, and Kenzo, you can also justify “dressing normal” as per Gap’s current campaign. Or, at the very least, pairing a sweatshirt with an ankle length skirt to channel any nineties teen film. It was a toss-up between yellow (a stereotypical spring colour) and florals, but all we could hear was Miranda Priestly’s voice (eight years later) and now here we are. Anyway! Every season has an it-colour, and Paris Fashion Week helped usher in spring 2015’s: yellow. But not like the Coldplay song (old and outdated)—softer, and paired with texture. Think: Paule Ka’s ruffled dresses or Emanuel Ungaro’s satin finishes. Basically, wear what interests you and you can’t really go wrong.